A newcomer to Australia is usually surprised that the toilet bowls here are different from those found in most countries. And no, I’m not referring to how flushed water spirals in the opposite direction here in the Southern hemisphere compared to those in the Northern hemisphere. That is a myth, by the way. If the design of the toilet bowl is the same, the flushed water should spiral in the same direction regardless of hemispherical location. I’m actually referring to the fact that toilets here don’t have one flush button or lever but two! That’s right, you have two options here. One for the full flush (usually indicated by a full circle) and one for the half flush (usually indicated by a circle with a diameter line). A few people are confused by the concept of the dual flush system though. They are afraid of underestimating the amount of flush they need after going to the toilet (and consequently, leaving evidence of their usage). In case you are one of the confused, the half flush is for Number 1’s and the full flush is for Number 2’s. Studies conducted in 1993 simulated the estimated projected water savings in Australia, over time, of a 6/3 litre dual flush system compared with other flushing volumes. The study addressed total current population, projected population, total current number of households, projected number of households, number of toilets per household, and flush volumes in current use. The results of the study showed that water consumption from toilet cisterns (litres per person per day) has fallen from 55 litres in 1982 to 18 litres in 1993. Data from the study clearly showed that, for Australia, the amount of water used for toilet flushing in the year 2020 was anticipated to be less than the amount used in 1991. This result was achieved even with a projected population increase to 26,707,000. We’re lucky that we have dual flush toilets here, specially now that there is a water shortage crisis. If we didn’t, we could have run out of water a long time ago. Now, if only the flushless urinals take off in Australia, too. Are you originally from the Philippines but now live in Australia? Do you miss the taste of Jollibee burgers? Well, there is a place where you can eat something close to Jollibee‘s burger steak meal minus the rice plus fries. If you live in Melbourne, Sydney or Brisbane, then you’re in luck because there should be an Ikea store near you. For those of you who don’t know, Ikea is a Swedish furniture megastore that sells inexpensive household items that has branched out around the world, including Australia. They don’t only sell furniture and household knickknacks, though. They also have a restaurant that serves really cheap meals, too, to feed all the busy and tired shoppers. Our favourite meal from Ikea’s restaurant/cafeteria is the Swedish meatballs meal. It’s basically a dish with 10 pieces of meatballs served with gravy, some berry sauce and chips (French fries) all for $6.50. I love the meatballs all by themselves but what is a bonus for me is that the taste of it reminds me of Jollibee’s burger steak meal (burger patty with gravy and rice), only better. So, for someone like me who misses the taste of homegrown fastfood, the meatballs meal was a welcome treat. It’s the day before Melbourne Cup Day. A lot of people didn’t come to work to take advantage of a four-day-long weekend. I wasn’t one of them. It was actually quite pleasant to come to work when a lot of people didn’t. There’s less traffic and less crowding. And there were more fruits left in the fruit boxes this morning, too. Anyway, come lunch time, I was raring to meet up with Raquel at Australia on Collins for lunch. Raquel microwaves our packed lunch while I hurry off to the meeting place and buy two orders of small steamed rice at the Chinese fast food counter. We do this often enough that the people working at the Chinese fast food recognises us and knows our order even before we make it. I thought it was going to be an easy tram ride from the East end of Collins Street down to the Swanston Street tram stop (going down West). However, when I got to the tram stop, there weren’t any people. There weren’t even any cars along Collins Street. I thought that was odd. I looked down toward the west end of Collins Street and it seemed like the road was blocked off. Darn. That meant I had to walk all the way to Oz on Collins which was two blocks away. I was pretty hungry at the time so I really could’ve used a tram just about then. When I finally got near to Swanston Street, I discovered that the whole street was barricaded to make way for the Melbourne Cup parade going through Swanston. That also meant that there was no way for me to cross to the other side of Collins Street where Raquel was waiting for me with our lunch! Just what I needed, more delays. I then walked north along Swanston Street’s east sidewalk looking for a gap in the barricade where I could cross over to the west side of the city. After a block and a half, I finally got to the end of the barricade. However, the barricade actually only turned into Swanston Street from Bourke Street. That meant that I had to continue walking west with the hope that the next major street won’t be blocked off. One block later, I turned south and walked the block and half distance back to Collins Street. Thankfully, the parade has moved on and I was able to walk straight to Collins Street without further delays. When I got to Collins Street, I turned east toward Swanston Street. Another half-block later, I finally arrived Oz on Collins and had my lunch with Raquel. Too bad I was hungry and in a rush to get lunch, though. I wasn’t able to stick around Swanston Street and take photos of the celebrities, the bands and performers that were in the parade. Before moving to Australia, the only time I have the feeling of being electricuted was when I touch an electric appliance or device that wasn’t properly grounded. Now, whenever it starts to get colder, I often get zapped with static electricity when I touch anything conductive. Supposedly, it has something to do with the dry cool weather. When it is warm and humid, the moisture in the air helps disappate any static electricity charge you have. When it is cold and dry, the only way the static electricity gets discharged is when you touch something conductive resulting in a slight electric shock. So, getting zapped is something you should come to expect if you are someone planning to migrate to Australia from the Philippines. Over the years, I’ve tried of different ways to avoid getting zapped. I try to discharge the static by touching my palm on a brick or wooden wall first before touching the metal door knob. For a time, I thought it worked but I still get zapped sometimes. Recently though, I’ve discovered a method that works the best for me. Before I touch something metallic, I would hold one of my keys and use that to touch the metallic object. I still get zapped, sure, but it isn’t as painful as touching the object directly. The key seems to distribute the charge more evenly. And before writing this short blog, I’ve read that you can do the same using a coin instead. It’s good to know that something similar to my method was something that was being recommended by others as well. There are already a lot of arguments amade about how reduction of emissions meant those people who work for coal and oil would lose jobs and how introduction of alternate power sources will generate new jobs. But at the end of the day, it all boils down to this: If we don’t act now to save the planet we live in, everything else won’t matter as we would all be dead anyway. It should be a no-brainer. Saving the environment should be the top most priority. Our very lives (and our children’s) depend on it. Mag Nation is fast becoming my favourite hang-out in the city during our hour-long lunch break thanks to the availability of the UK-made science-fiction and fantasy digital arts magazine, ImagineFX. I’ve gone back there almost every day this week just to browse through their issues of ImagineFX (which is perfectly Okay with the shop and, in fact, they encourage browsing). There was a special issue of ImagineFX in the shop which was a compilation of the best bits of the first ten issues. If I remember correctly, the price tag says it’s worth $26 plus. It seems like a good bargain but I’m not too excited about spending more than 20 bucks for a magazine, even if it was a best-of issue. I held off buying it but I kept on coming back just to browse through the one and only copy in shop. Then yesterday, I couldn’t find the special issue on their shelves. Someone must have finally bought it. Too bad, I thought. Maybe I should have bought it for myself when I had the chance. However, today, I got my chance. The magazine magically returned on the shelf but it looked a bit worn than I remembered it (probably my fault anyway) and the price tag was missing. I went to the register counter with the magazine and asked, “Can you please tell me how much is this old magazine?” with emphasis on the word “old”. He consulted the PC by the counter then told me that the issue was now down to $19.95. Wow! It certainly pays to be patient sometimes. Needless to say, I bought it. And when you buy a magazine at Mag Nation, you also get a coupon for a free coffee. Raquel and I wanted to use it right then and there. Last time I asked about the free coffee, the barista didn’t know what size is available for free with the voucher. Of course, I took advantage of this and ordered the large cup at the time. This time, the barista knows that I should only get a small cup. However, after I asked the barista real nicely if I can have a regular cup of mocha, he acceded to my request. After that long digression, I finally come to the part of my story about the cursed coffee cup. When the barista handed me my hot cup of mocha, I found the paper cup a bit too hot to hold. I asked if I could have serviettes (what Aussies call paper napkins here). They were all out so the barista offered to just put my cup in another paper cup to insulate my fingers from the heat. Sounded like a good idea. After taking a few sips from the cup, Raquel and I decided it was time to return to our respective offices. As I crossed the street to get to the tram stop, then my cup that has a plastic lid on suddenly began spitting out the coffee from the tiny hole on the lid on to my coat’s right sleeve! Just great. When I got to the tram stop, I placed the coffee cup and the magazine I bought on the tram shelter’s bench so I can take out my handkerchief and wipe the coffee off my coat. But as I was wiping my coat, I must have accidentally knocked the cup because it fell over and started to spill coffee on to my newly bought magazine! I immediately set the cup upright. Thankfully, the magazine was in a paper bag so it actually didn’t get wet. I had to chuck the paper bag though. After catching the tram, I got off near my office. As I was walking towards our building, the coffee cup spat out more coffee but on to my slacks this time. Argh! I promptly wiped my pants dry and proceeded to get back to my desk. As I was opening the door to my office floor, more coffee was spilled but I was able to avoid getting wet this time. The floor wasn’t as lucky. By the time I got to my desk, there wasn’t really much coffee in my cup left. I’ve always been a klutz and I hate it. This must’ve been the worst case of clumsiness I’ve experienced to date. I strongly suspect that this series of unfortunate events was caused by having a second cup over the first one. 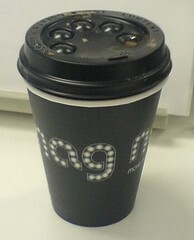 Whenever I make a walking movement, the first cup could freely bob inside the second cup and make the coffee spill out. There will be a media convention this weekend called the Armageddon Expo. I’ve always wanted to go to a geek convention but have so far been disappointed with the ones I went to here in Australia. Makes me sometimes wish I live in the US so I can go to the different Comics and science-fiction conventions there. Well, one day while at a comic book shop along Bourke St near the Parliament side (sorry I forgot the name of the shop), I saw these flyers about the upcoming Armageddon Expo. I looked at the events and guests and realised that it is a convention about a lot of things: science fiction, animation, comics and, uh, wrestling. Alan Tudyk. I first knew about him in the movie A Knight’s Tale with Heath Ledger. I loved his character there and for a while I thought he was really British. But I like him best for his role as Wash in the Firefly TV series and the Serenity movie. If he is in a movie, I’ll probably watch it. Joe Flanigan. I’m a big fan of Stargate SG-1 and its spin-off series, Stargate Atlantis. It’ll be great to see Lt. Col. John Sheppard in person. Connor Trinneer. Trip (Cmdr. Charles Tucker III) must be my favourite Star Trek Enterprise character. I also like his Michael the mutated Wraith character in Stargate Atlantis. He is definitely another sci-fi celebrity I’d like to see. Bruce Timm. He designed the style of the later Batman Animated series. I so want to emulate his style that I even bought a how-to-draw book he made for kids only a few years back. Check out samples of his art here. Billy West. I couldn’t possibly miss the opportunity to meet the voice of Philip J Fry from the Futurama series, my favourite sci-fi animated comedy show. He also provides the voice for the Professor (Hubert Farnsworth), Dr Zoidberg and Zapp Brannigan. There are other guests there that I might be cool to see in person (such as John Wesley Shipp who plays the Flash in the old TV series and Dawson’s dad in Dawson’s Creek) but the people in the list above are who I want to see the most if I do go there. For a complete list of guests, go here. I wanted to go on Saturday but Joe Flanigan is only available on Sunday. I still have to think about it but I’m now more inclined to go on Sunday. While running for the tram stop during my lunch break, I passed a tall dark Indian man in a gray business suit and horn-rimmed glasses walking in the opposite direction. He stopped and called out to me. Maybe I knew the guy, I thought, so I stopped. After giving a better look, I decided that he was a complete stranger. But what did he want? “You have a lucky face!” said the stranger with all smiles as he gestured his thumb vertically down across his face. Huh?! I’m a little hard of hearing so I was thinking that maybe I misheard him. Maybe I had something on my face, I thought. “You have a lucky face!” he repeated still smiling as he did the thumb gesture across his face again as if that will help make it easier for me to understand him. I continued to look confounded. “Do you know why?” he asked. Apparently, he mistook my silence as a sign of my interest. I wasn’t really listening anymore and started to edge away from him. He said something like I will have three lucky somethings in my life and so on. It sounded like he was predicting my future — a good future. But, for all I know, he was actually giving me a nicely worded curse. However, I still feared that it was just an elaborate sales pitch. So I thanked him and bid him goodbye the first chance I got. As I started to sprint up the street again to catch a tram, I looked back at the stranger. He was still smiling as he turned to continue walking down the road. It was a very odd encounter. It felt like I was in a Stephen King story and this mysterious person had just given me a fore-shadowing of things to come later. Either way, I hope that I do have a lucky face. I could surely use all the luck I can get. Name a book that would entertain you for hours, give you discounts and ideas on where to go, what to do and where to eat in addition to giving you the opportunity to help a charity? Nothing comes to mind? Well, try the Entertainment Book! What exactly is an Entertainment Book? It’s a book that is chock full of discount vouchers from a variety of establishments. Although most of the discounts were for dining in restaurants and orders from takeaway shops, it also features great savings on several attractions, activities, movies, theatre, video shops, travel accomodations, magazines, online shopping and some miscellaneous items like gardening and even dry cleaning services. I’ve been contemplating on whether to get myself a copy of the Melbourne entertainment book since late July but didn’t really act on it till about a fortnight ago. I was planning a weekend in the future when we could go to the Dandenong Ranges, perhaps have a picnic, visit the small towns nearby and ride the Puffing Billy (hubby’s long-time request). The regular ticket for an adult from Belgrave to Emerald or Lakeside is $19 one way or $32.50 return. It’s quite pricey and I was racking my brains to cut costs when I remembered seeing an offer in the entertainment book. I searched through their website and found that the book offers a complimentary regular fare when another regular fare of equal or greater value is purchased. Now, depending on whether we get a one way or return ticket, that’s already 31% or 54% of the price of the entire book! Of course the book won’t be of much value to us if we could only use one discount voucher so I browsed through their site. To my delight, I found several restaurants we regularly go to on their list and cinema offers that we surely use. Then there are the vouchers for other attractions we’ve been meaning to go to but haven’t had the chance yet like the Rialto, Melbourne Aquarium and Old Melbourne Gaol among others. Having decided to finally get my copy, I googled to see where I get one. The book comes in several editions, concentrating on major cities/regions in Australia and New Zealand. I’m after the Greater Melbourne edition, which would set me back $60 plus postage. The Cancer Council of Victoria offers the lowest postage cost I could find at $6 (other institutions quote $7-$10 postage). It’s important to note that a portion of the price ($12, for the Melbourne edition) goes to the charity organisation selling it. Anyway, the council had an online shop and I placed an order for one. A week passed but no book came. I went back to the cancer council’s site and submitted an online enquiry regarding my purchase. A lady working for the council replied back soon after, apologising for the delay because their servers went down and the order has not been processed. She then proceeded to ask for my details and promised to send the book later in the day. True to her word, the book arrived the next day. Now, when I saw photos of the book online, there was really no sense of scale and I imagined it would be the size of a paperback novel. I was a bit off the mark because although the book did look like a paperback, it was quite big and heavy (weighing in at 1 kg). No wonder they were quoting no less than $6 for the postage! Aside from the book, a gold card was included with the package. Although paper vouchers could be torn from the book and presented for instant discounts for most establishments, the gold card should be used when eating at fine dining restaurants. The card number could be used to register in the entertainment book website, where members could read and submit reviews of the different activities, establishments and attractions included in the book. The members only section is also useful for keeping track of changes and updates to current offers and getting some bonus offers as well. With a validity of up to June 2008, I still have plenty of time to get the most value from the book. So far we’ve already saved $28.95 by using the book’s vouchers and we even haven’t used the Puffing Billy voucher yet. I’m also being cautious of not overspending just for the sake of getting a discount. I’m not sure yet how much value we could get from this book but it’s certainly looking like it has been a good investment. I’m currently keeping a log of the vouchers we’ve used so far so perhaps I could do a review of the whole entertainment book come June. One thing is certain though, there would be some fun times ahead for us without having to break the bank! To err is human and this saying has been brought home to us by two incidents in the past few weeks. The first one involved incorrect entries in the group certificates given to us by our employers. There was an entry in one column that was reported as a separate income but was actually already included in our gross income. This meant the amount of tax withheld from our salary each pay period was not nearly enough and that we would have to pay more tax. In fact, hubby and I have almost a grand tax payable when we filed our returns last month. The good news about this PAYG amendment is that we probably would not have to pay as much tax as originally computed. The bad news is that if we decide to go back to the tax agents for them to take care of the amendments, we would have to pay $45 each for the appointment. This would also mean more documentation and the possibility of mistakes and confusion cropping up in the future. What a hassle! However, there’s really not much we can do except do the extra work ourselves. We decided we’d just print the amendment form from the tax office’s website, fill that out, attach the necessary documents and hope that everything goes well after that. Another instance when someone else’s mistake created more work for us involved our health care claims history. I consulted with my osteopath a fortnight ago and had my claim for insurance coverage rejected by our health care provider. Both my osteopath and I were puzzled, I’ve only had five consultations with her previously and there’s no way I’ve already reached the claims limit for the year. Aside from that, there doesn’t seem to be any other logical reason why my claim should be declined. I SMSed hubby, who coincidentally also had an osteopathy consultation earlier that day, if his claim had also been declined. He said no, his claim went through without any problems. First thing I did when I got back from the osteopath’s office was to check our health insurance account online. It was then that I discovered that my previous consultations with my osteopath have been entered into hubby’s name. Looking at our claims record, you’d think that hubby goes to two different osteopaths twice a week, most of them even occuring within a day of each other! I quickly composed an email requesting an amendment of our claims history and asking for the reason why my claim was declined on that day. After several email exchanges, we found out that my osteopath had been incorrectly entering ‘1’ on the HICAPS system, thinking that I am the primary policy holder. In fact, she should have entered ‘2’ to indicate that the claim should be for me, the secondary policy holder. I had to ask my osteopath for a letter stating that it was me who consulted with her all along with a list of the consultation dates and send it to our provider. As to the question of why my claim was rejected, it didn’t have anything to do with reaching the yearly maximum claim amount allowable at all. The claim was declined because they only allow one claim per person per day. Since hubby had already claimed for that day with his own osteopathy session and because my osteopath is trying to claim under his name as usual, the request for payment was declined. I was asked by the health care insurer to fill out a claim form, send them the receipt and post it all via snailmail to have my last claim honoured. When I checked our online records today, the request for the amendment of the claims had gone through yesterday. All fine and dandy? Well, no, there was still one incorrect entry on the adjustment they made. Now they have charged hubby’s last osteopathy session to me and have totally ignored my separate claim for that same day. Argh, why is this so difficult!?! All this grief just because someone else wasn’t paying attention. Perhaps I should send these people a bill for lost time and productivity and then maybe they’ll be more careful next time.